Many patients who have suffered tooth loss mistakenly believe that a partial denture is their only replacement option. Either that or they simply have to go through life with missing teeth. Today, your choices are no longer limited. Dental implants are a superior and accessible alternative. Dental implants are permanent prosthetic teeth that can restore your smile. Unlike dentures, dental implants are not removable as they are anchored to your bone. The implant itself is capped with a custom-made crown that looks exactly like your original teeth. Dr. Thorne can provide you with dental implants to replace a single tooth or multiple teeth. 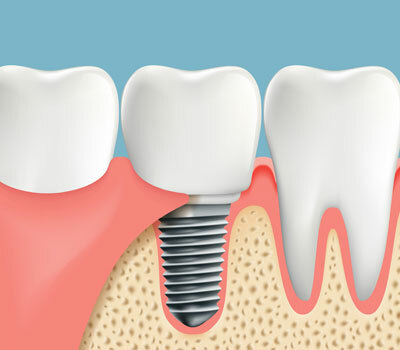 Dental implants require a total of two to four office visits over several months. The process begins with a consultation. If you and Dr. Thorne agree that dental implants are the way to go, Dr. Thorne will install the implants in his office. After some time to allow your new implants to integrate into the bone of your jaw, you will receive your permanent crowns. You’ll then be able to enjoy a perfectly natural-looking smile, eat your preferred foods, and forget about your tooth loss altogether. Contact Thorne Family Dentistry at (817) 503-8000 to learn more about dental implants or schedule an appointment.